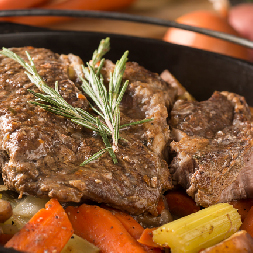 This simple pot roast will have you begging for more… carrots, onions, potatoes galore. It’s a one-pot wonder! Place a large Dutch-oven over medium to high heat and add 2 tablespoons of oil. Salt and pepper both sides of the roast liberally. Once the oil is hot, brown the roast for about 5 minutes on each side. Then move to a plate. Add 1 tablespoon of oil to the pot. Add in onion, potatoes, and carrots. Cook vegetables for 8-10 minutes, or until they begin to brown. Add water, balsamic vinegar, beef broth, Worcestershire sauce, thyme, roasted garlic and a few dashes of salt and pepper. Place roast back in the pot and place over heat. Once it starts to simmer, cover it with the lid and move to the oven. Roast for up to 3.5 hours, or until tender. Once cooked, move roast to a cutting board and then tent it with foil. Let it rest for up to 10 minutes, then garnish with fresh parsley. 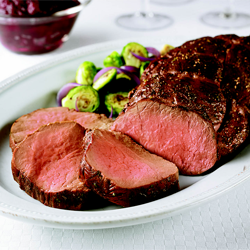 Rump roast, or bottom round roast, is a lean cut of beef. This means rump roast is naturally tough, but can become a tender masterpiece when cooked properly. It’s also a fairly inexpensive roast compared to other types of beef, so your wallet won’t feel the cut. There are a couple of methods that are best for preparing a rump roast. Oven roasting and braising tips and recipes are featured below to help you master your way around the kitchen. Heat oven to 325 degrees F for a 2 to 4 pound roast. Season roast, if desired. Place roast (straight from the refrigerator), fat side up, on rack in shallow roasting pan. Insert oven-proof meat thermometer so tip is centered in thickest part of roast, not resting in fat or touching bone. Don’t add water or cover. Rump roast should cook for 30-35 minutes per pound. Remove roast from oven when the meat thermometer registers 145 degrees F for medium rare (it is recommended to cook it to medium rare only). Transfer roast to carving board. Tent loosely with aluminum foil. Let roast stand 15 to 20 minutes. The temperature of the roast will continue to rise 5 to 10 degrees F to reach desired doneness. Carve into very thin slices. 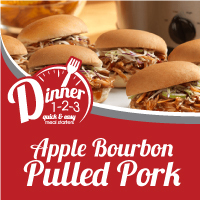 Pair it with cooked vegetables like carrots, onions, or potatoes, and your dinner guests are sure to be impressed! Heat oven to 325°F. Combine fennel seeds, basil, oregano, salt and pepper in small bowl; rub over the beef (for more intense flavor, apply the rub to the roast the day before; cover and refrigerate overnight). Heat large nonreactive Dutch oven over medium-high heat until hot. Add oil, heat until hot. Brown beef 5 to 6 minutes, turning to brown on all sides; remove from pan. Add onions to Dutch oven and cook over medium heat 3 to 4 minutes or until slightly softened, stirring occasionally. Increase heat to high; add red wine. Bring to a boil, stirring to scrape up any browned bits from bottom of pan. Boil 1 minute; stir in tomato sauce. Return beef and any accumulated juices to pan; stir in bell peppers. Place round of parchment paper directly on beef and wine mixture. Cover and bring to a boil. Braising: A cooking method by which food (usually meat or vegetables) is first browned in fat, then cooked, tightly covered, in a small amount of liquid at low heat for a lengthy period of time. The long, slow cooking develops flavor and tenderizes foods by gently breaking down their fibers. Braising can be done on top of the range or in the oven. A tight-fitting lid is very important to prevent the liquid from evaporating. Yummy Tavern Style Pot Roast made in your slow cooker!